So goes Shakespeare’s Sonnet 73, giving the title to this dramatic musical piece based on his love sonnets, an inspired pairing between cellist Lucia Capellaro and actress Katherine Heath as together, with Martin Parr directing, they explore meaning between word, its timbre and music, including some of Bach’s cello works, at The Rose Playhouse, Bankside. Structurally the premise might seem odd and I was interested to see how the narrative form of the sonnets, which are perhaps meant more to be read and where Shakespeare is supposedly narrating to a young male lover in some, would find dramatic intensity and meaning on stage. But the structure as a whole is genius- as if the whole performance is a sonnet itself. Typically most of Shakespeare’s sonnets will spend three quatrains posing problems or thematic concerns, leaving the final couplet to provide resolution. Cleverly Martin Parr’s piece mirrors this schematic form- on the one hand we have one lover who is sometimes even spatially apart [in a most beautiful and unexpected tableau at the head of the piece] and whose language plays out through her cello music set provocatively and sometimes conflictingly against Katherine Heath as, in their little domestic surroundings of a bed, table and chair, she in turn spits, rages, exults in the sonnets and rails against love’s experiential whirlwind. 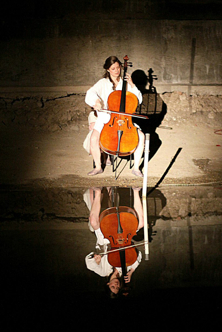 In answer to Heath’s words, Capellaro’s cello is sometimes in a juxtaposed discordant rhythm to her lover’s Iambic Pentameter, at other times there is harmony, plucked strings soothing her lover’s sighs and sorrows. The narrative problem that is finally posed is when Capellaro is unfaithful, her cello signifying either herself and her unfaithfulness or another lover in a clever visual image- but it’s wonderfully resolved at the end of the performance when Martin Parr solves the problem of their opposing words and melodies with a beautiful, unexpected harmonious solution- a device for which and the meaning of which, words cannot express, only point to. Perhaps the intended meaning of Where Late the Sweet Birds Sang. The Rose’s spatial aptitude is also used to affect, the great searching light beam picking out the figures as they move as if on a distant shoreline, encouraging us to think of distance and love’s strange unreal qualities, the feelings of which can only be expressed through movement and distant images. The nitty gritty and the love exchanges between the pair, which is expressed like dialogue through the verses, can only take place in the more real bed chamber or at the kitchen table. For a first time visitor to The Rose, the performance will be a revelation. Not least because of The Rose’s history- built in 1587, twelve years before the Globe, it was the Bankside’s first purpose built theatre. Originally on the site of a rose garden, its remains were not discovered until 1989, after which followed a high profile campaign to save it from being turned into a car park.….. It now seeks 5 million in funds to turn the ¾ archeological site, the ruins of the old theatre still partly submerged in water a meter down, into a completely excavated education centre and fully functioning theatre in two years. If Where Late the Sweet Birds Sang is a measure of the kind of virtuosic performances and spatial abilities the Playhouse can provide, then it can only be hoped that it will receive its funding and become the fully equipped educative and theatrical space it deserves to be.